The Friends of Dudhope Park AGM is being held at 6.00pm on Monday 5th March at Dudhope Centre, St Marys Place, Dundee. Come along for an update on the group’s activity and how you can get involved. This entry was posted in Uncategorized on February 15, 2018 by Rick Curran. Dundee Decides is your opportunity to decide how Dundee City Council should spend the £1.2 million Community Infrastructure fund. 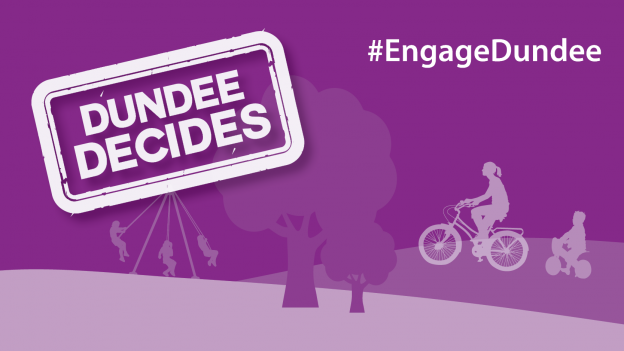 The fund will be used to make improvements based upon suggestions identified during the Engage Dundee Consultation. Dundee has 8 electoral Wards: Strathmartine, Lochee, West End, Coldside, Maryfield, North East, East End and The Ferry. Each ward has been allocated up to £150,000 to spend on infrastructure improvements. If there are any funds left over after the winning projects have been selected, the remaining funds will be allocated to enhance the winning projects in each ward. Voting is open from 29th January to the 23rd March. Dudhope Park is in the Coldside ward then you can vote to allocate some money towards additional lighting in the park. The aim is to install lighting along the path from the corner of Dudhope Park at Lochee Road to the corner at the top of Barrack Road where it meets Dudhope Terrace. This entry was posted in Uncategorized on February 5, 2018 by Rick Curran. There will be a Friends of Dudhope Park meeting on Monday 5th February 2018 at 6.00pm in the Ashram (Dudhope Centre). We’ll be discussing plans for our annual AGM which takes place next month. It would be great to see you there so please come along! This entry was posted in Uncategorized on February 1, 2018 by Rick Curran. Happy New Year! There will be a Friends of Dudhope Park meeting on Monday 15th November 2018 at 6.00pm in the Ashram (Dudhope Centre). We should have a positive update about the public toilet situation in the park. It would be great to see you there so please come along! This entry was posted in Uncategorized on January 11, 2018 by Rick Curran. There will be a Friends of Dudhope Park meeting on Monday 20th November 2017 at 6.00pm in the Ashram (Dudhope Centre). This entry was posted in Uncategorized on November 16, 2017 by Rick Curran. There will be a Friends of Dudhope Park meeting on Monday 18th September 2017 at 6.00pm (note earlier start time!) in the Ashram (Dudhope Centre). This entry was posted in Uncategorized on September 14, 2017 by Rick Curran. There will be a Friends of Dudhope Park meeting on Monday 14th August 2017 at 6.00pm in the Ashram (Dudhope Centre). The main topic on the agenda is the planning for the fun day in the park on Saturday 26th August between 11am and 3pm. The Dundee Therapy Garden in the old bowling green in the park is up and running and are looking for some volunteers to help them. They offer help and support to ex military and ex emergency services personnel. At the moment they would like to recruit gardening, cookery and mental health volunteers. Please have a look at the information below which has the details of the posts and how you can get in touch with the group. We need people who are patient, kind and willing to listen to our clients. It can sometimes be challenging working with people suffering with severe mental health problems, but is also incredibly rewarding. Our mental health volunteers are asked to attend one day a week reliably as our service users like to know who they can expect to see in the garden on a given day. Our garden is fairly big and requires a lot of maintenance. It is sometimes hard for us to keep up with it while focusing on sessions. For this we require people who have a little horticultural knowledge or who are prepared to learn. Given that we have lots of fresh produce to eat, but we have very little time for cooking during sessions, we are in need of someone who enjoys cooking to prepare and eat lunches with us and our service users – and possibly teach the odd dish to interested clients! This entry was posted in Uncategorized on August 11, 2017 by Rick Curran. 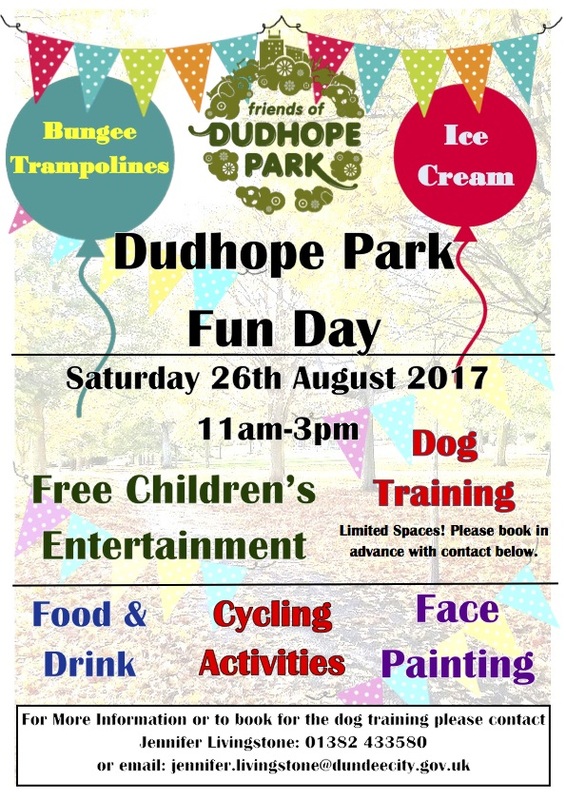 The Friends of Dudhope Park are pleased to be holding a free family Fun Day on Saturday August 26th. There will be various things to do for all ages such as cycling activities, face painting, dog training, bungee trampolines and more! If you are interested in the dog training then please get in touch with Jennifer using the details below as there are limited spaces available. This entry was posted in Uncategorized on August 9, 2017 by Rick Curran. There will be a Friends of Dudhope Park meeting on Monday 12th June 2017 at 6.00pm (note earlier start time!) in the Ashram (Dudhope Centre). This entry was posted in Uncategorized on June 1, 2017 by Rick Curran. There will be a Friends of Dudhope Park meeting on Monday 15th May 2017 at 6.30pm in the Ashram (Dudhope Centre). This entry was posted in Uncategorized on May 2, 2017 by Rick Curran.